Happy Monday! 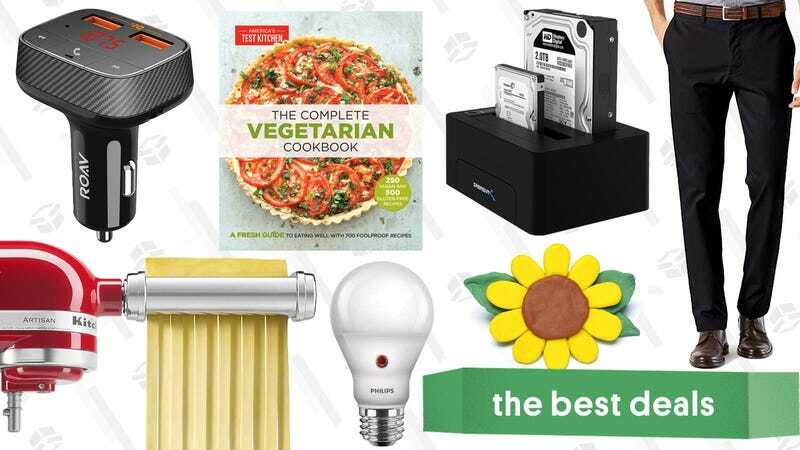 The KitchenAid pasta roller set, Levi’s and Dockers discounts, cheap Kindle cookbooks, and more lead off today’s best deals. Samsung’s adorably tiny portable SSDs leave flash drives and external hard drives in the dust, and the 500GB and 1TB models are cheaper than ever today. It’s still a lot more expensive than a portable hard drive, but in addition to the speed and size advantages, it should be more durable as well, due to a lack of moving parts. If you have any old hard drives or SSDs lying around, this affordable docking station can turn two of them into USB external drives for any computer, and it’s marked down to just $19 in today’s Gold Box. We post enclosures like this fairly often, but this is pretty unique in that it supports both 2.5” and 3.5” drives, and can even clone one to the other without the use of a computer. Even if you don’t need that feature though, it’ll basically be the coolest looking desktop external hard drive money can buy. Yamaha’s YAS-108 is one of our readers’ favorite sound bars, and the most budget-friendly option among our Co-Op finalists. Normally priced at $200, it’s down to $180 on Amazon right now, only the second deal we’ve ever seen (it was $170 a few weeks ago, but only very briefly). If you have laptops, phones, or Nintendo Switches that can take advantage of fast USB-C Power Delivery charging, these Aukey charger deals are a great excuse to stock up and add more charging points around your house. If the reader-favorite Breville Smart Oven line is a little out of your price range, Panasonic’s Flash Xpress toaster oven took second place in our reader poll, and it’s down to $98 today, which is within $1 of the best price we’ve seen this year. While cheap toaster ovens will toast bread (usually poorly), a fancy one like this can act as a full-featured (and faster-heating) oven for anything that’ll fit inside. If you ever shop at Target, you should have a Target REDCard. It comes in both credit and debit forms, and both save you 5% on almost everything Target sells. But if you want a little added incentive to sign up, if you get the card between now and 9/22, Target will send you a $30 off $100 coupon in the mail. It has a few restrictions, but with everything Target sells, you should have no trouble using it. The best part of the REDCard: You don’t have to carry it. You can link it to the Target app on your phone, and use that at checkout at any Target store. Magnetic smartphone vent mounts are our all-time top sellers, so there’s a good chance you already have one in your car. My advice though? Get one for your luggage; you’ll be really glad to have it next time you rent a car, and they also work as kickstands for your phone on an airplane tray table. This one’s only $5 today with promo code AUKEYDP5. Levi’s and Dockers are associated with jeans and khakis, respectively, and you’ll indeed find plenty of those in today’s Amazon Gold Box. But dig a little deeper, and you’ll also find deals on wallets, belts, shirts, and more. There are dozens of styles on sale for men and women, all with Prime shipping available, but just note that these prices are only available today, or until sold out. Osprey makes some of the most popular camping backpacks around, and you can grab one for your next excursion from this one-day Woot sale. All four models include a CamelBak-style hydration pack, but unlike most CamelBaks, that’s merely a feature of these larger backpacks, not the entire point. Socks! They’re not exciting, but you could always use more of them. Luckily, some really good ones are on sale right now. On the men’s side (not that most socks can’t be unisex), these Gold Toe athletic socks are some of our readers’ favorites, and this six pack works out to only $2 per pair. If you prefer lower cut socks, this 10-pack from Enerwear is just $14, or about $4 less than usual. Women, frankly, have the more exciting deals today. The same Enerwear sale includes four pairs of premium merino wool socks for $15, or a half dozen soft modal dress socks for $11. This is the best time of year to go camping, so grab this four person pop-up tent from Coleman and get out there. It’s just $43, so you’ll have plenty of money left over for whiskey your other essential camping supplies. Tilly’s has another big sale, this time taking 50% off clearance items. Shop their men’s and women’s sales featuring denim, sweatshirts, jackets, hats, and shoes from favorites like Adidas, Nike, Vans, and Converse. Plus, our readers can use code KINJAFREESHIP for free shopping on orders of any size. PUMA’s back at it again with another friends & family sale, this time taking 40% off all full-priced items, and an extra 25% off sale items, with promo code BESTFRIEND. Obviously, shoes are a go-to here, but you’ll find workout and casual clothes for all seasons in here too, so stock up! Update: The coupon is gone, but $17 is an excellent price for this. Neutrogena’s Hydro Boost water gel sunscreen is a pretty good facsimile of Biore’s cult favorite (and personally life changing) Watery Essence sunscreen, with one notable difference: It’s actually sold in the U.S.
You can read more about the water-based sunscreens in my recent review, but spoiler alert: They completely changed my perceptions about what sunscreen can be. Amazon’s currently offering three bottles of the SPF 30 for about $16 (with subscribe & save, or $17 without), which is over $10 less than usual, and only about $5 more than they usually charge for a single bottle. In addition, there’s a 30% coupon you can clip, bringing it down to about $11. For three bottles! This is madness! I feel certain that this deal will not last long. Just be warned: Once you try it, you’ll never buy anything else. If you played Cuphead and Hollow Knight and thought, “psh, this is too easy,” allow me to recommend BRIO’s original Labyrinth game, now just $22. Navigate the marble through the maze using two knobs, and try to reach the end before you throw the entire thing through a window. It’s a little late for back to school season (hey-ooo), but you can save about $10 on the Harry Potter Hogwarts Express LEGO set today, complete with Platform 9 3/4, plus Harry, Ron, Hermione, Remus Lupin, Trolley Witch, and Dementor minifigures. Plus Scabbers; we can’t forget about Scabbers. It usually retails for $80, but you can keep a little bit of extra cash in your Gringotts vault, because it’s down to $69.